The 2014 Hyundai Veloster R-Spec gives you strong performance at a low price. If you like the 2014 Hyundai Veloster Turbo, but not its price tag, have we got a treat for you—the Hyundai Veloster Turbo R-Spec. The second special edition of the Hyundai Veloster, the R-Spec offers the performance you want at a lower ticket price. Just like the base Veloster, the R-Spec offers consumers with a futuristic-looking vehicle that easily sets the hatchback apart from other cars on the road. While it does reflect a lot of the same styling cues as its more traditional sibling, the R-Spec adds a red splitter and red rocker-panel accents, along with an R-Spec badge, and a Sprint Grey exterior color that’s model-exclusive. To gain the same pep that the Veloster Turbo has, the R-Spec uses the exact same engine, which is a turbocharged 1.6-liter four-cylinder that produces 201 horsepower and 195 lb-ft of torque. 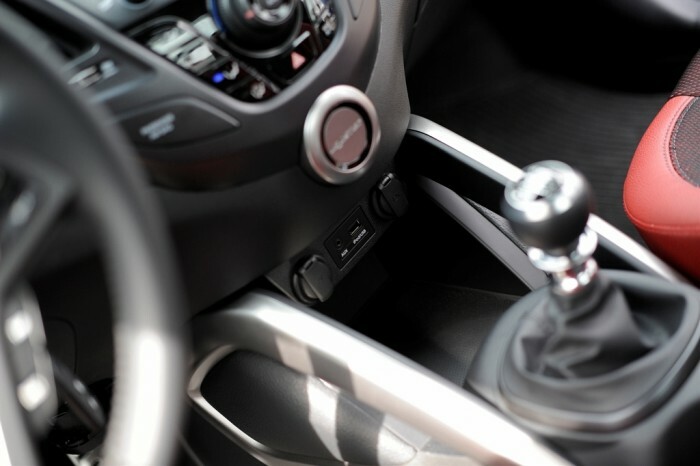 This special edition is only offered with a six-speed manual that has a shifter modified by B&M Racing. Because it has such a kick to its engine, the R-Spec gets slightly less mpg than its base model, though it still isn’t too shabby with only 24 city and 33 highway. Like many of the hipsters that gravitate to it, the Veloster Turbo R-Spec features a V-neck look with its center stack, showing off a bit of technology cleavage (that is definitely not hairy) with an easy-to-read LCD screen. While its cabin isn’t much different than the regular Veloster, it does have one thing that truly sets it apart—an exclusive red-leather trimmed interior, which also features red cloth seats covered with black mesh, giving passengers a bit of a peep show. The rear seat isn’t extremely functional if you’re looking to haul four passengers around, thanks to its limited space, but the rear seats fold down to extend the cargo space. The 2014 Hyundai Veloster Turbo R-Spec has many of the same safety features as the regular Veloster. It includes traction and stability control, multiple airbags, antilock brakes, and Hyundai BlueLink, an emergency telematics system.